Talk about late to the party! Many long moons after the release of the Too Faced Love Palette, I finally bought one, took many, many photographs of it, including my usual stellar swatches and then dug in and started to enjoy it. What I failed to realize, until just very recently is that I didn't do anything with those photographs and I didn't write up my post about this palette. A bunch of unedited photos have been taking up space on my hard drive and eating their heads off for lack of exercise. Time to put them to work! 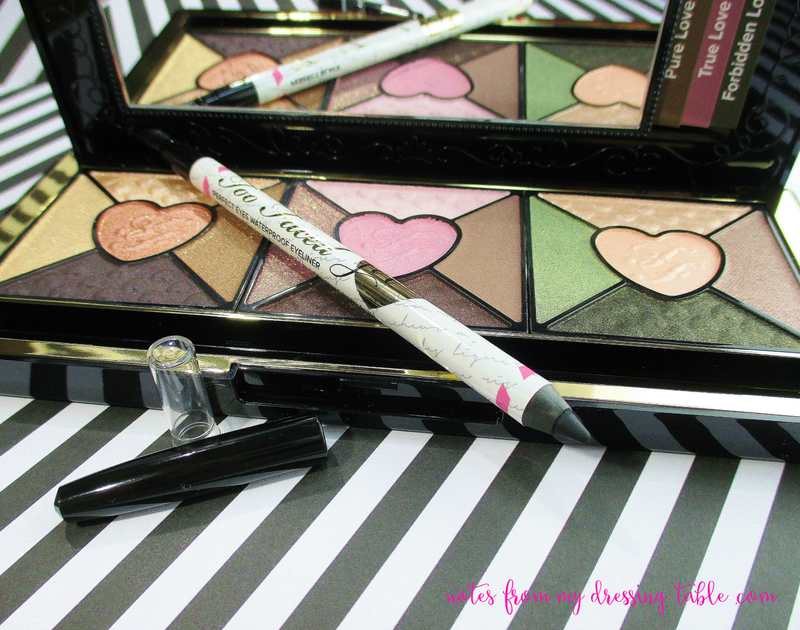 So, here it is, my review of the Too Faced Love Palette. Encased in a hard shell plastic case with a secure closure, the top is decorated with a love letter, ribbons and hearts, the Too Faced logo and a "wax seal" as well as the iconic air mail red slashes all the way around the edges and a cancelled stamp all on a crisp white ground. There is a clear plastic overlay and the packaging is all trimmed in black with a vintage feel embossed decoration. I dare say, more than a tiny reason why I bought this palette is because it's so pretty! Open the lid and set in the black plastic is a good sized mirror that is plenty big enough to do your eyes or lips, tho I wouldn't want to use it for full face. The plastic surrounding the mirror is embossed with the Too Faced logo, curliques and folderols. It's just too adorable. Tucked into a slim slot behind the mirror are look cards, three that correspond, one each to a shadow quint. How clever. Set in polished gold and black are three shadow quints, for a total of fifteen eye shadows, each named for a kind of burning love. The center of each quint has a beautiful heart shaped accent shadow pressed with the Too Faced logo and the top and bottom shades are embossed with tiny raised hearts. Have I mentioned that this palette is pretty? The shadow formula is a slurry powder technology that transforms a liquid powder blend into soft, velvety pigments that offer beautiful performance. Included with the palette is a Perfect Eyes Waterproof Eyeliner in Black. It's a nice liner with a rubbery smudger on the other end, my only gripe with it is my only gripe with all liners of it's ilk... I have to sharpen it. It's 2015. We have the technology, we can build pencils that don't have to be sharpened. Why? Oh, why are cosmetics companies still trolling us with these old school pencils? A little swatchiepoo of the liner. Nice, huh? The first quint is Pure Love: Warm, soft, golden, grounded. The next quint is True Love: Sweet, effervescent, delicate and passionate. Finally we have Forbidden Love: Cool, slightly dark, a bit... Jaded. 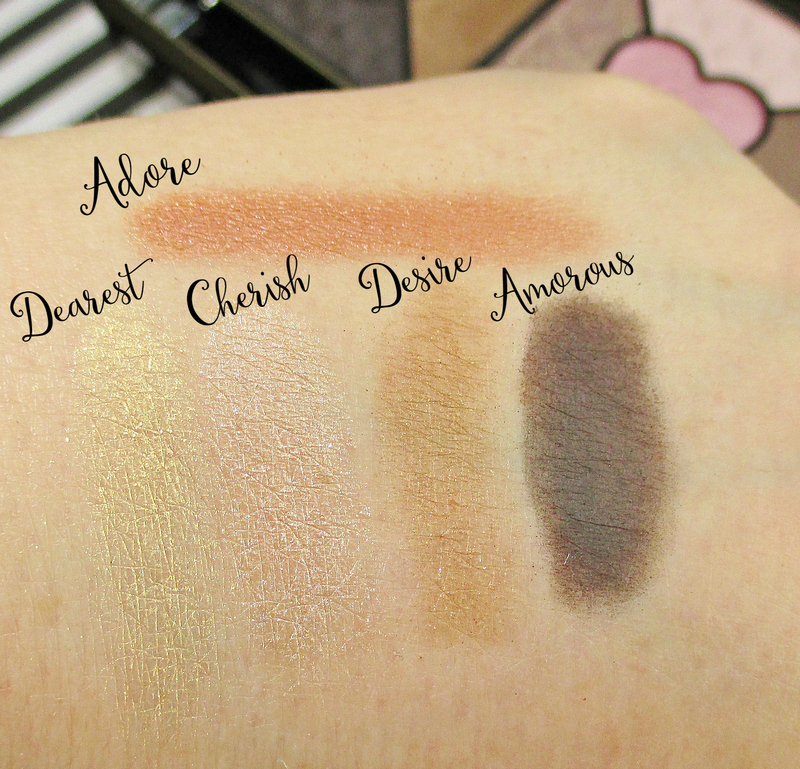 All of these shadows have very good pigmentation and perform well on the eyes. 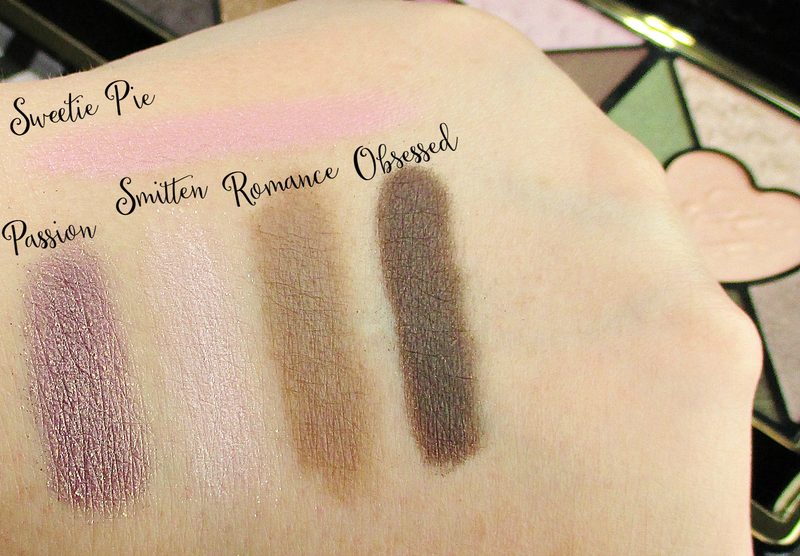 XOXO is a near match to my skin tone, hence why it isn't showing up well. 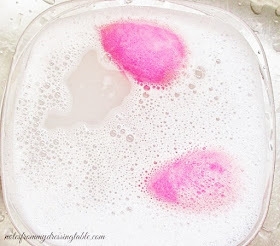 All of these shadows can kick up a little powder or be a little bit flaky when you go in with a brush, just tap off before you go to your eye and you're cooking with gas. 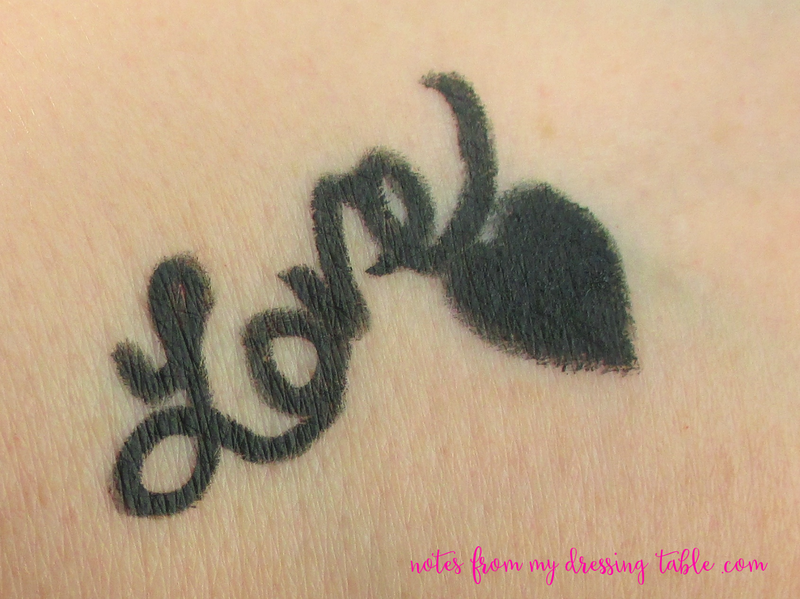 The shadows apply very nicely, build and blend out smoothly and easily, for the most part. Obsessed and Amorous need a little cozening but they are workable with patience. What fallout I experience for the most part easily flicks away with a soft brush or a Q-Tip. 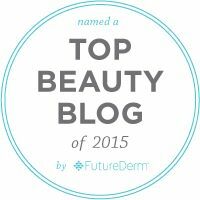 I apply over primer and I enjoy all day, fade resistant wear. I like this palette and I'm happy that I bought it. If you would like to know if I recommend it, yes, I do and with the holidays coming up, this palette would make a lovely gift for a friend, sweetheart, any makeup lover really. Or yourself. You work hard. You deserve a little love letter to you. You can buy it from Sephora, it is $49.00. 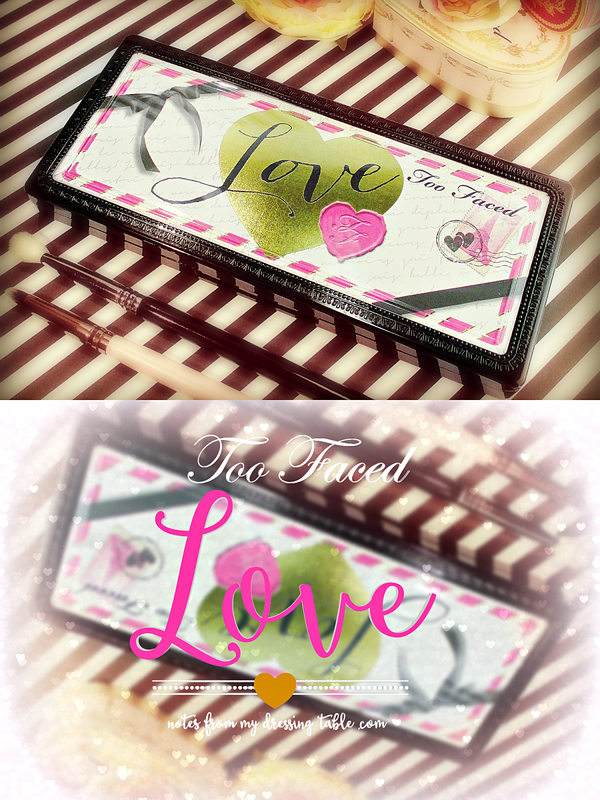 The Too Faced Love Palette is cruelty free, has no phthalates, sulfates and is gluten free, as well. Do you own this pretty palette? How do you like it? Do you think that you might like to pick it up, either for yourself or as a gift?